Co-hosted by Altitude Running, this free fun run will begin at the Altitude Running store at 6pm (show up early to check out their shoes and gear) and then finish at Zwei Brewing. Depending on the preferences of the group, runners will be able to preview parts of either Leg 2 or Leg 3 of the Boulder Beer Chase route along the Mason Trail. This will be an out and back route so runners can choose a distance that works for them. 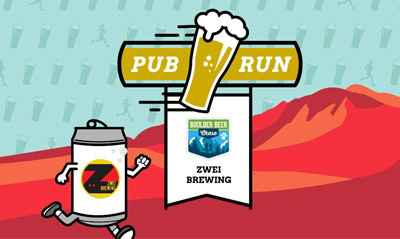 After finishing the run at Zwei, grab a complimentary pint, hear more about the Boulder Beer Chase, grab some Beer Chase swag and maybe win a giveaway (not to mention a great discount code that can be used towards a team entry). 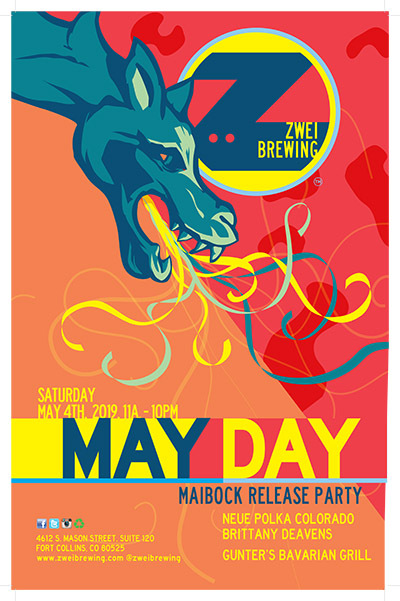 Join us and raise a glass of our Maibock for this German spring celebration! There will be music from Neue Polka from 1pm-2:30pm and Brittany Deavens from 3pm-5pm. Also, Gunter's Bavarian Grill will be providing the German food. 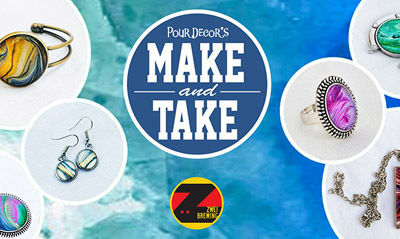 Come make some unique, one-of-a-kind jewelry with the help of local artist Carolyn Snyder, owner of Pour Decor. Stop by Zwei Brewing for a beer and make a fun, new piece of jewelry for yourself or as a gift for someone else! Pick from different colors and designs, as well as jewelry/accessory pieces like earrings, rings, pendants, bracelets, keychains, and purse/bag hooks. Ticket cost is $20 for the materials and one pint of beer, and you can buy your tickets here. Any additional jewelry pieces can be made for the cost of $12. This is a kid/family friendly event. The event is drop in (open house style) and can be completed at whatever pace you determine (average of about 45 minutes from start to finish). This is a mess-free activity (no painting involved). Tickets can be purchased day of at the event, but it is recommended that tickets be purchased in advance. Join us once a month, for yoga and a beer! 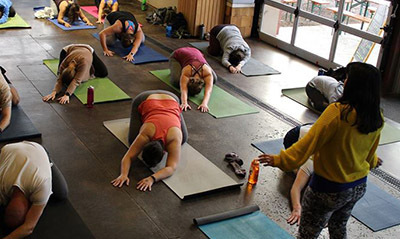 It's an all levels yoga class, and afterwards join us at the bar for a medium beer included in the $10 class fee, or save the beer for another time. A part of your class fee will go to Until They're Home. Also, remember to bring your own yoga mat. See you Saturday mornings Zwei Yogies! Join us at Zwei Brewing for comedy improv and some beer! Similar in style to "Whose Line is it Anyway," the Comedy Brewers is a high octane comedy show featuring Fort Collins' most exciting new improv comedians performing a series of games and scenes all based on audience suggestions. Since its inception, the Brewers have been packing the house with their improvisational shows at the Bas Bleu Theatre. It's a fast, hysterical, unique and highly interactive show and has been proven to be the most fun allowed by Colorado law. Get your tickets to this great improv show at the bar in the Zwei Brewing taproom only. Tickets are limited, so get your tickets now before they're gone! 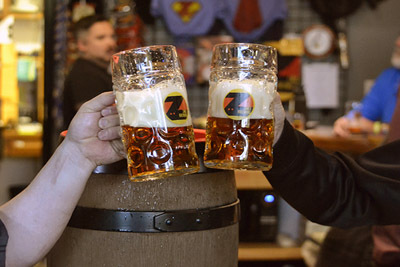 Bring a friend and raise a Maß at Zwei. 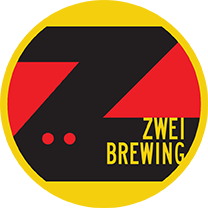 Every Tuesday from 11am to 4pm at Zwei Brewing we'll be doing a growler fill special. From 11am to 2pm you get $3 off growler fills. 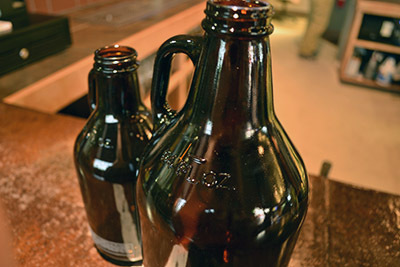 From 2pm to 3pm you get $2 off growler fills. From 3pm to 4pm you get $1 off growler fills.